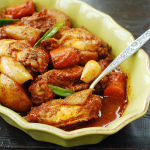 For those of you who have been asking for more slow cooker recipes, here’s another one for you! Sataejjim (사태찜) is a traditional braised dish that’s made with bite sized beef shank meat (satae). 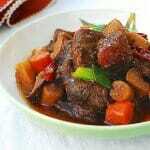 The method and flavor are similar to galbijjim (갈비찜), braised short ribs. Beef shank meat is a tough cut of meat with lots of connective tissues. Slow cooking breaks down the collagen into a rich, flavorful gelatin. Sataejjim is often a cheaper or less fatty alternative to galbijjim in Korea. 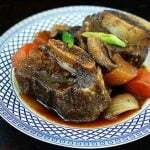 Beef shank is typically sold bone-in here in America, but it is sold boneless in Korea. 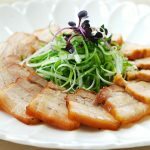 It’s a popular cut of meat for making soup and braised dishes such as jangjorim (soy braised beef). 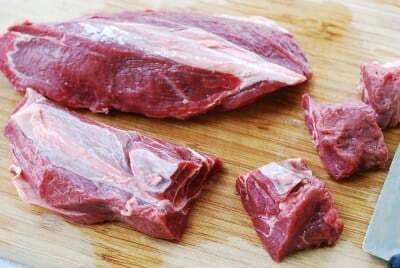 You can find boneless beef shank meat in Korean markets. If you are using bone-in pieces, cut the meat off the bones into bite sizes and throw both the meat and bones in the slow cooker. The bones will impart great flavor to the dish. The seasoning is very similar to the one used for galbijjim. Traditional sataejjim (and galbijjim) calls for grated Korean pear. For this recipe, I experimented with apricot preserve. It worked great! Instead of Korean radish, which is traditional in Korean braised dishes, I used some other root vegetables here for a change. I used a combination of parsnip, celery root, and burdock root, which I had in the fridge. You can, of course, use Korean radish, and turnip can also be good. 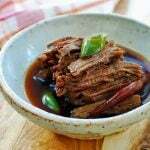 A traditional Korean braised beef shank dish made in the slow cooker! Rinse the meat. Drain well or pat dry with paper towels. Cut the meat into about 2-inch chunks. Prepare the vegetables by cutting into about 1-1/2-inch chunks. 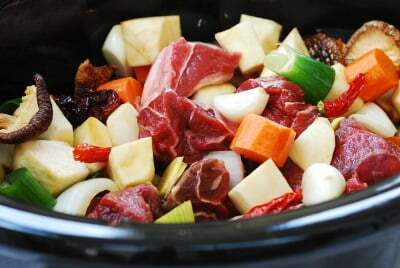 Place the meat and vegetables in the slow cooker. Mix together the soy sauce, rice wine, apricot preserve (or honey), sugar and pepper in a small bowl, and pour over the meat and vegetables. Toss everything to coat with the sauce. Cover, and cook for about 4 hours on high or 6 to 8 hours on low. Flip the meat over midway through the process, if you’re home. Adjust the cooking time, depending on how tender you want your meat to be. If necessary, sprinkle with a pinch (or two) of salt, and add more sugar or honey to taste. Stir in the scallions and sesame oil before turning the slow cooker off. Remove the meat and vegetables from the slow cooker to a large serving bowl. Pour the sauce over the meat to serve. You can run the sauce through a strainer for a clearer sauce if you’d like. If you want to use Korean pear, skip apricot jam. Use 1/2 of a medium size pear by cutting into chunks. Use the same amount of honey and sugar in the recipe for sweetness. This was delicious and easy! Great flavor and hearty for winter (in Australia). I thickened the broth with some cornstarch and a small spoonful of gochujang at the very end. Thank you for the recipe! Braising is frying the meat first to add surface caramelisation and flavour, then cooking slowly. 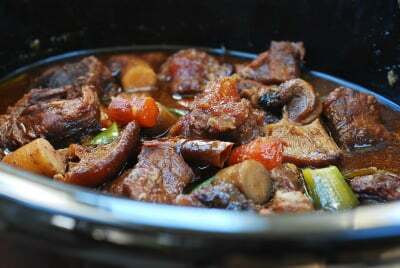 Maybe add a braising step before adding to the slow cooker for more flavour? Can this be made in an Instant Pot? If so, how long would you cook it for? Thanks for all your wonderful recipes! Yes, definitely! It took 20 min when I tried with a half of the recipe, so you may need 25 minutes for the whole recipe. You’re welcome! My pleasure! We always love your recipes and this one was no exception! A total hit with the whole family and it came together so easily. Your recipes are truly addictive! Thanks so much for sharing. This cut of meat is sold in Kosher butchers as “kolichel.”. Good to know if you can’t find Korean cut of beef. The spelling has a few variations, but easy to find, plenty of recipes online. This is a great new way to cook. I loved it it turned out great. Since I use my slow cooker more than my stove it made this dish very easy to make. Hi Mrs. Ro! I love your website and delicious looking recipes. I just recently found your site & have only tried 1 dish so far & it was a real hit with my family. I’m looking forward to trying out many more of your recipes. I am Taiwanese-American and my husband is Korean-American, so I want to learn more Korean recipes from you :). I am wondering if I make this recipe in the Instant Pot, how long do you think it would take to cook on high pressure? Also, I purchased a boneless beef chuck roast, not shank. Would that taste as good? Thank you so much! Hi Shirley! Happy to hear you found my blog and tried a recipe that your family liked. I’d say 25 minutes for boneless, tough cut of meat that’s cut into about 2-inch chunks. Beef chuck will be good. I love your website! 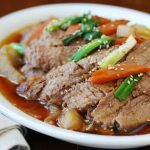 I just got a slow cooker and your recipes are pretty straightforward for meats cooked to perfection, Korean-style. 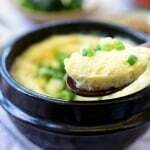 I just made this and it’s delicious but I will try it with Korean pear next time. 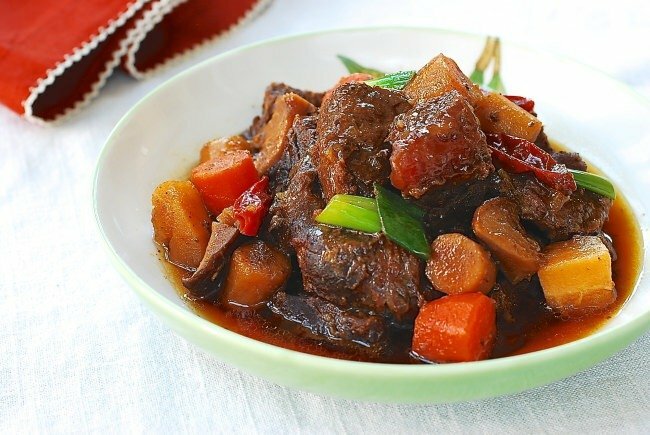 Is there a Korean recipe for ox tail? 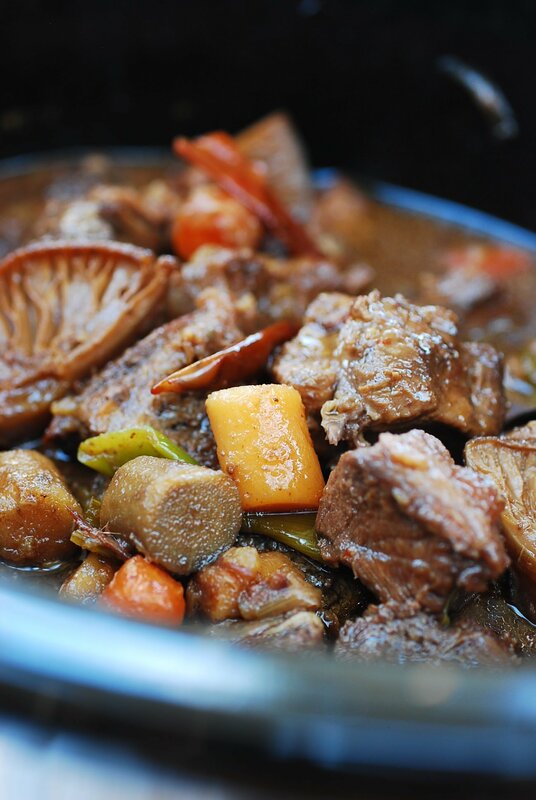 I have Instant Pot ox tail recipe. You can use the recipe to cook in the slow cooker. You’ll need to cook about 4 hours on high heat or 6 to 8 hours on low heat. LOVED this recipe although I cooked diced oyster blade steak instead as it was what I had then cooked it in the pressure cooker after sealing the beef. I also added some gochujang as we like things spicy. I thickened it at the end although I couldn’t stop taste testing the juices haha! So good! Thank you.